A Department of Homeland Security center distributed a counter-terrorism bulletin to law enforcement warning about an online petition on the popular advocacy website Change.org. The bulletin doesn’t warn of any impeding violence or terrorist attacks. It begins: “A petition has been added to the Change.org website…” It goes on to say that “outrage has been expressed” as a result of the petition. 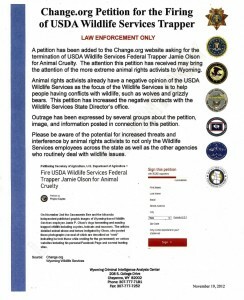 The Homeland Security bulletin warns that “the attention this petition has received may bring the attention of the more extreme animal rights activists to Wyoming.” It cites no threats, property destruction, violence, or any other crime. The bulletin bluntly says that “animal rights activists already have a negative opinion of the USDA Wildlife Services.” This is certainly true, but it’s not limited to animal rights activists. The bulletin was distributed by the Wyoming Criminal Intelligence Analysis Center, which is a Department of Homeland Security “fusion center.” This is far from the first time that lawful, First Amendment activity has been included in counter-terrorism bulletins produced by fusion centers. The Project Coyote petition currently has more than 60,000 signatures, and can be signed here.